Great Barrier Reef scuba diving on Reef Experience a luxurious, all inclusive catamaran providing excellent value day trips to The Great Barrier Reef. M.V. 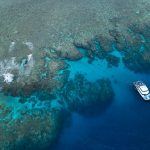 Reef Experience visits two, pristine Outer Barrier Reef locations daily with plenty of time to scuba dive, relax and snorkel. Being one of the fastest boats in the Cairns Marina, Reef Experience takes you to some of the furthest and therefore premium scuba diving destinations, and boasts up to 6 hours at the reef! We have been operating trips to the Great Barrier Reef for over 20 years it’s our passion to share this outstanding destination with our clients Reef Experience is a full day tour that we have put together after 27 years of providing trips to the Great Barrier Reef to what we believe is the best trip going to the Great Barrier Reef at certainly the best value. 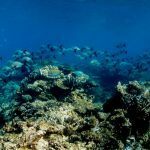 Saxon Reef – is level with Port Douglas an outer Barrier Reef location Renowned for huge Manta Rays, friendly inquisitive moray eels, great for diving or snorkeling. Hastings Reef – 58 kms off Cairns, lays 10 sq. kms of colourful coral gardens. Famous for Tame Friendly Reef Sharks, finally the Giant Wrasse, and thousands of tropical fish. 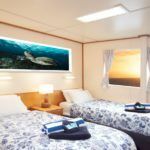 Michaelmas Reef – Virgin Reef – Located 40 kms off Cairns, offers shallow coral reefs, and a dazzling array of exotic marine life including Giant Clams over 100 years old. Breaking Patches – Amongst forest of staghorn coral, black coral trees, and sea fans, a huge breeding ground for turtles where you will meet our little rock star ‘Tina Turtle” and her friends. Our Top Deck package on board Reef Experience requires a minimum of 2 people per booking to operate All Inclusive Great Barrier Reef Tour Your day starts with a cooked barbeque breakfast and fruit platter, fresh hot and cold buffet lunch prepared by your own onboard chef and a complimentary wine and cheese platter on the journey back to Cairns. All scuba diving equipment hire and national park fees are inclusive in the trip cost. 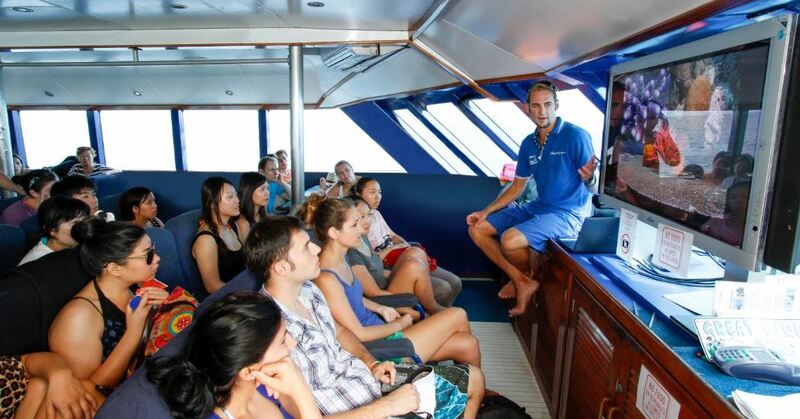 Glass bottom boat tours and Marine Biologist interactive presentations are included activities all may participate in, and passengers can choose between spacious fully-air conditioned saloon areas or a large luxurious sundeck fully equipped with cushioned sun loungers. Certified Scuba Dive Included Go on a morning scuba dive and have the option to sign up for a second dive in the afternoon, with plenty of time to snorkel in between! * *Some medical conditions may prevent you from diving. For example: heart disease, asthma, epilepsy or diabetes. If See ‘Important Information’. *Flying after scuba diving: We recommend that you do not fly for at least 24 hours after scuba diving. The Best Equipment As a certified diver on Reef Experience, you will be diving with high quality, up to date scuba diving equipment. With our purpose built dive deck, everything is set up for you ready to go so getting into and out of the water couldn’t be easier! Got your own gear? 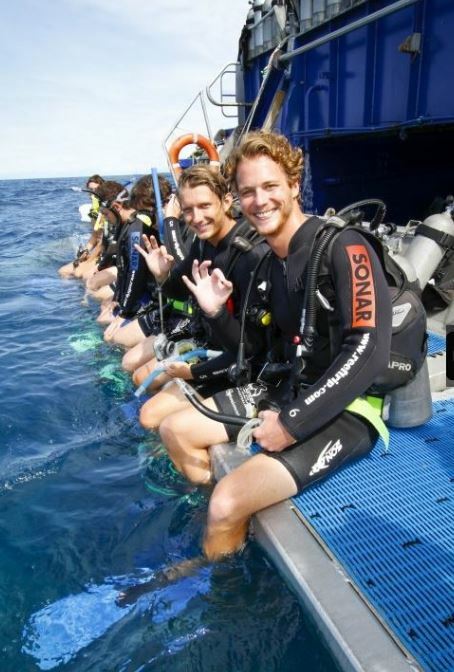 Our friendly dive masters will assist you to set up your equipment. Full scuba dive briefings are given for each reef location by experienced crew with in depth knowledge of the areas and marine life which can be found. How deep are the dive sites? As the coral on the Great Barrier Reef needs sunlight to survive and grow, the majority of good dive locations are found in relatively shallow areas. Our dive sites have an average depth range of 10 – 25 meters (30-80 feet). Who will I be scuba diving with? Buddy up with another passenger or take the guided dive option, it’s your choice. If you’re travelling alone our friendly dive team will ensure you have a buddy to go diving with. Guided Scuba Dives Go on a guided dive with one of our friendly and professional dive team and take all the hassle off navigating yourself! Our experienced guides will show you the best dive spots, get you back to the boat and ensure you have a fun and comfortable scuba. Optional Extras Reef Experience has its own fully licensed bar, stocked with drinks, chocolates, chips and reef souvenirs. Second time scuba dives are at an additional cost of $65 AUD. 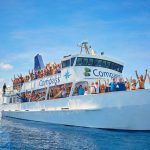 Snorkel or scuba dive with a qualified Marine Biologist – If you have heard the marine biology interactive presentations and want to learn more about the reef where you are snorkeling whilst having fun, go on one of our marine biology snorkel tours. Digital camera hire is available onboard. Minimum age for scuba diving activities is 12 years (10 years if already a qualified diver). Some medical conditions may prevent you from diving. For example: heart disease, asthma, epilepsy or diabetes. If you are unsure of a particular medical condition, please check with us prior to making your reservation. Flying after scuba diving: You should not travel to a high altitude (fly or visit a mountain area etc) within 12 hours of completing a single dive or 18 hours after multiple dives. It is recommended to wait 24 hours, if possible, before doing so. Please bring your certification card or divers logbook if you are a qualified scuba diver – the dive supervisor will require to see it before you may participate in certified dives. If you do not have proof of certification, please contact us prior to your trip to avoid disappointment on the day. 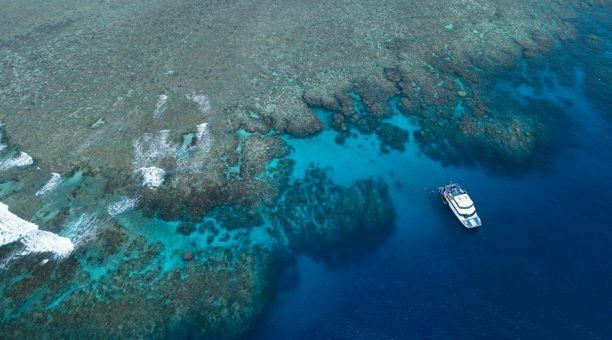 The Great Barrier Reef is the perfect place to try resort scuba diving for free! 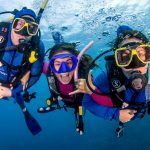 If you are thinking about taking the plunge our ‘no-experience necessary’ Resort Scuba Dive Day Trip is the way to do it! Whether you’ve never tried scuba diving before or you’ve got a few under your belt, a morning scuba dive is a great start to the day for all who love an adventure. 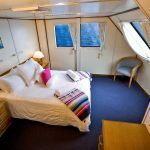 Reef Experience is a luxurious, all inclusive catamaran providing excellent value day trips to The Great Barrier Reef. M.V. Reef Experience visits two, pristine Outer Barrier Reef locations daily with plenty of time to scuba dive, snorkel and relax. Being one of the fastest boats in the Cairns Marina, Reef Experience takes you to some of the furthest and therefore premier dive destinations, and boasts up to 6 hours at the reef! An all inclusive trip! Remember with Reef Experience there are no hidden charges. 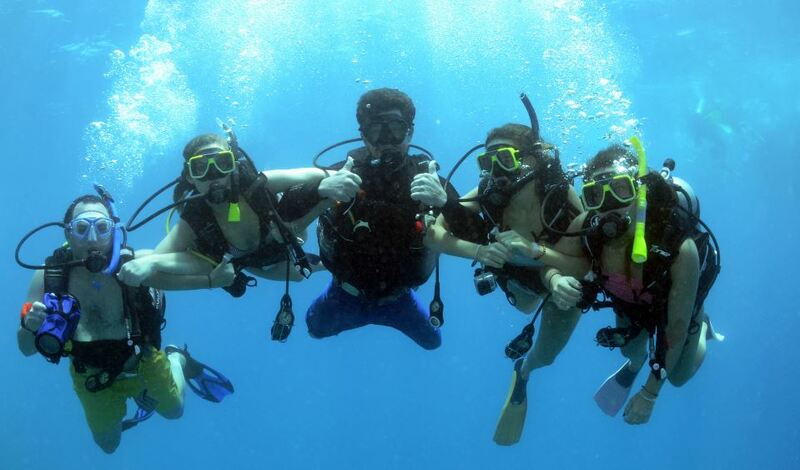 About Resort Scuba Diving Included in your Reef Experience day trip is the option to try a free Resort Scuba Dive. *some restrictions apply. Let our friendly and experienced Dive Team show you the best of this world heritage listed marine park. How it works Before entering the water you will be given a 30 minute briefing that will outline the basic information required for a safe and enjoyable introduction to the sport of Scuba Diving. 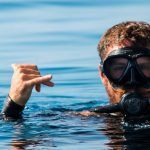 Under the watchful supervision of your Dive Instructor, each person is then taken underwater to a shallow, purpose built dive bar where we will assess your comfort level just below the surface. Once comfortable, your Instructor will take you on an underwater guided tour of the reef. What will I see? Be awestruck as your Dive Instructor points out the myriad of wonders beneath the surface. Maybe you’ll learn how to make colourful Christmas tree worms disappear, swim amongst schools of parrot fish or even find a friendly sea turtle! The ocean is your oyster! If I love it, can I dive again? Yes. Reef Experience visits 2 Great Barrier Reef locations every day so if you love your first Resort Scuba Dive, you can sign up to do a second dive at the next reef …and there’s still plenty of time to snorkel in between! We share our passion to give you the best holiday memories money can’t buy! You should not travel to a high altitude (fly or visit a mountain area etc) within 12 hours of completing a single dive or 18 hours after multiple dives. It is recommended to wait 24 hours, if possible, before doing so. This is important information if you were planning on flying out of Cairns or visiting the Tablelands within these time periods. Unlike other day boat operators, Reef Experience does not have fixed reef locations that it visits every day. 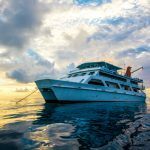 We use years of marine experience to decide where will be the best areas to dive and snorkel in different weather conditions and we go there. This ensures you get the most out of your day at the Great Barrier Reef. Being one of the fastest boats in the Cairns Marina, Reef Experience takes you to some of the furthest and therefore premium dive destinations without compromising your in-water time. 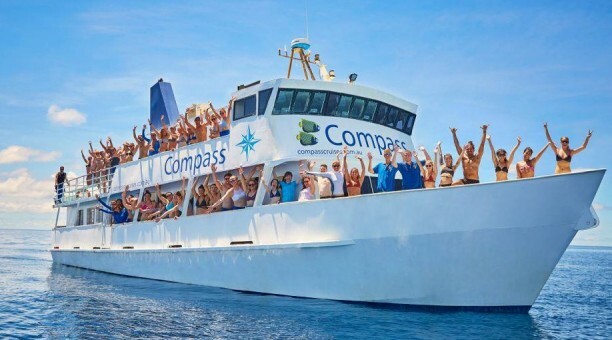 Included Your day starts with a cooked barbeque breakfast and fruit platter, fresh hot and cold buffet lunch prepared by your own onboard chef and a complimentary wine and cheese platter on the journey back to Cairns. All dive and snorkeling equipment hire and national park fees are inclusive in the trip cost. Other Activities Glass bottom boat tours and Marine Biologist interactive presentations are included activities all may participate in, and passengers can choose between spacious fully-air conditioned saloon areas or a large luxurious sundeck fully equipped with cushioned sun loungers. Camera Hire Reef Experience has it’s own professional photographer, so if you wish to have your first scuba diving captured on film you can! Digital underwater cameras are also available for hire. The Best Crew Our friendly and experienced dive team will show you how to use your diving equipment and ensure you have fun, comfortable and exciting scuba adventures. On The Day Arrive at Reef Experience at 7:30am. Depart Cairns Marlin Marina at 8:00 am. Arrive back to Cairns at approx 4:30 pm. (All times subject to change.) Optional Extras Reef Experience has its own fully licensed bar, stocked with drinks, chocolates, chips and reef souvenirs. Second time scuba dives are at an additional cost of $55 AUD. Getting There Bus transfers from your accommodation to the Cairns Marlin Marina are included from all Cairns City areas. (Bus transfers from outer suburbs and Port Douglas are available at an additional cost).